Helllllo! I was hoping to get this post up yesterday but my morning was spent getting pictures taken of my crazy cute baby, and then the rest of the day I had an awful headache. So I am doing my best to focus before another one hits. February's Polish Pickup has a most interesting theme this month, "Famous Duos". It's interesting because it can be interpreting in a number of ways. A maker can choose a famous duo and represent it in one polish. 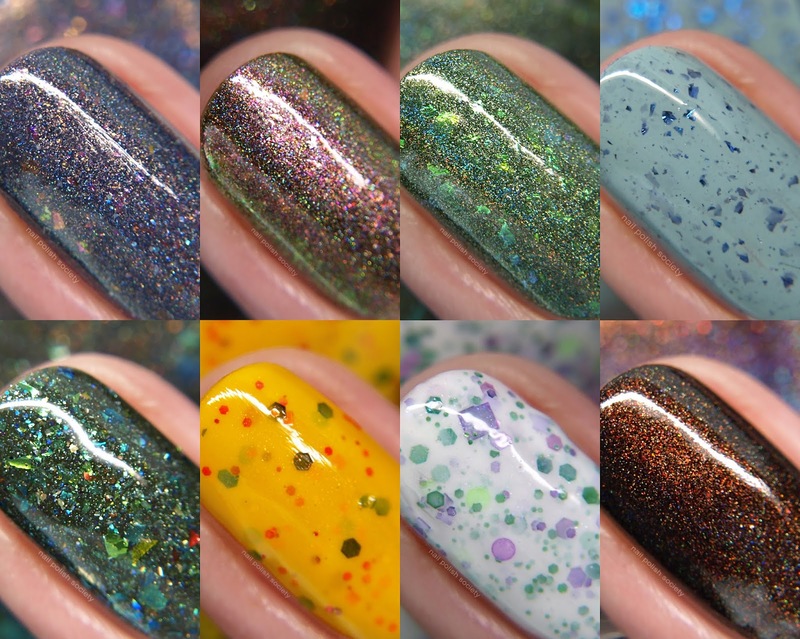 Or they can make two polishes, one for each of the pair, and offer one at the PPU website and one at their own. OR they can team up with another maker and tackle the duo together. Clear as mud? Good! Let's get to it..
"A rich organic green envelops a scattering of green unicorn flakes, while a linear holographic flame adds sparkle and shine. This pot-inspired shade is scented with an earthy faux cannabis fragrance blended with patchouli and clove notes." The fragrance is pretty spot on but is subtle enough not to be noticeable unless you smell your hands. Shown is two coats plus top coat. Colores by Llarowe "How About A Brownie Dogg?" A deep chocolate brown linear holo with original "unicorn pee" and aurora red to green to gold shimmer. This is the richest brown I have ever seen and the shimmer is just delicious! Shown is two coats plus top coat. Colores de Carol "The Spaceman"
A white crelly base with aurora shimmer and a mix of green and purple glitters. This is such a perfect Spring shade! It was really packed with glitter so I worked in thin coats. Shown is three coats plus top coat. Colores de Carol "The Cowboy"
A warm mustard yellow crelly with orange, red, brown, and blue glitters and mini holo gold stars. It had a nice thin and smooth formula. I didn't realize there were star glitters in the bottle until I was taking photos, so those might require some digging. Shown is three coats plus top coat. Painted Polish "Dusk to Dawn"
A steely blue/gray holo base with pink and gold color-shifting flakies, and holographic glitters. This is so stunning! It had a really smooth application. Shown is two coats plus top coat. Girly Bits "High Functioning Sociopath"
A tweed inspired polish in a mossy green/brown holo with color shifting shimmer and flakes. I can really see the inspiration in this one. Shown is three coats plus top coat. Emily de Molly "We're Here"
A duck egg blue/green creme with blue chrome flakes. The formula was really smooth and the flakes lay flat. Shown is two coats plus top coat. by Dany Vianna "Portable Swamp"
A muddy green jelly with scattered holo, multichrome flakes, and glitters in gold, green, teal, blue, and orange. Shown is three thin coats plus top coat. Colors by Llarowe "How About A Brownie Dogg?"